I found it! Every girl’s security blanket for summer. Benefit Stay Flawless Primer is just as important as that retro gingham picnic blanket you found at the flea. It is the answer to any embarrassing foundation faux pas, and a 15 hour (?!) yes 15 hour flawless face. Preface–> I am a big fan of all things Benefit. And I get a kick out of their packaging. 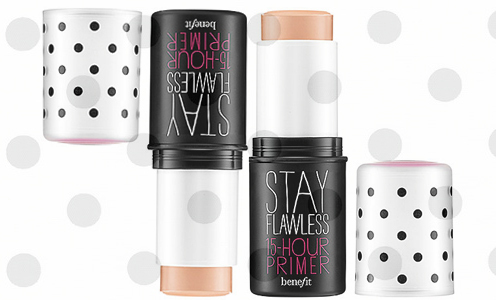 Benefit’s new Stay Flawless 15 Hour Primer (in stick form - awesome) with the polka dotted top is no exception. The other day I really put this product to the test. It was a task involving FedEx and a 30 pound box - a much bigger sweatier task than I had bargained for. The outcome: post cooling off and patting down, I glanced in the mirror to find a face that looked just as ‘flawless’ as it had 4 hours earlier. Some additional rosy-ness, sure, but zero need for reapplication. My make up had not melted - which truth be told was much than I was expecting, even from my beloved brand. After that, this friendly stick went from a ‘must-try’ to a ‘must-have’ in my black and white striped make up bag. Summer 2013, I AM READY FOR YOU. Does This: Keeps faces flawless for 15 hours, even while operating heavy machinery/moving large boxes in heat.